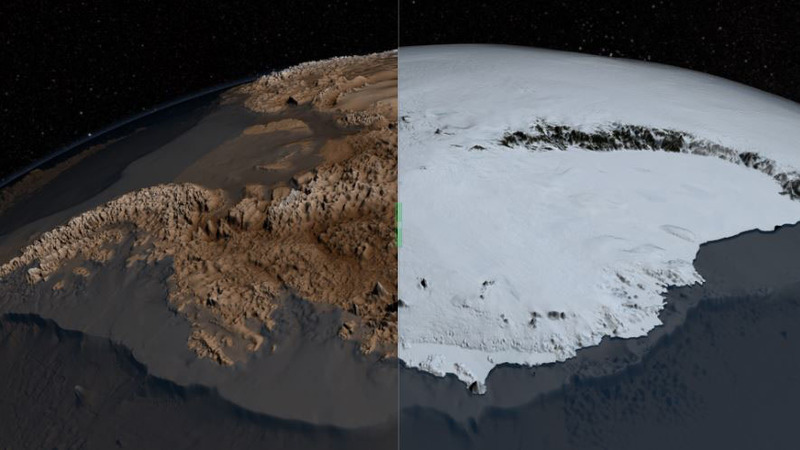 Home » Fascinating NASA map shows Antarctica Ice-Free: Evidence of Human occupation? When did this fabulous age exist and more importantly what caused the dramatic change? It must have been a sudden and dramatic change for there are no intermediate phases with changing vegetation patterns. And how did a five kilometer ice sheet develop inland in Antarctica where there is little snow or precipitation? These are impossible questions that modern geology struggles to answer. Did continental-drift bring Antarctica to the poles or was it a shift in the earth’s axes that not only caused the death of the tropical rain forests, but place a massive ice sheet on the continent? BEdMap2 offers a never before seen view of Antarctica. This is what Antarctica looks like the Icy would melt.